Carmen Mariah: A Cheeky Gift Guide! 1// Tumbleweeds Wooden Faced Sunglasses Round Wayfarers- $72- Okay, I can't stop obsessing over these sunglasses from Tumbleweeds. They're so adorable! I'm usually more of a fan of $12 H&M sunglasses, so this is a bit of uncharted territory for me. I just can't resist these, though! I'm really hoping to score a pair of these in my stocking! They seem like they're worth the investment, for sure. Such a unique design, and handcrafted. Perfect for that one hipster friend you have that already owns everything cool. 2// Handmade Leather Journal by Peaseblossom Studio - $32- I've always loved giving and receiving journals as gifts. They're a great gift for someone who you don't know very well, or someone who you know very well. Let me explain. One time, one of my best friends gave me a journal with a very sweet note on the first page. It has remained one of my favorite gifts I've ever received for years. It was so personal and special to me because there was such meaning behind it. On the flip side, if you're stumped as to what to give someone you're not very close with, a journal sort of says "Hey man, you probably know how to write. Here, use this!" 3// Big Bow Scarf by Susannah Bean- $48- I do love me a big comfy knit. Susannah makes the greatest little creations in the prettiest colors that could be. Any lady would love opening up this cozy scarf on Christmas morning. It's a good girlfriend or Mommy gift! Knowing that it's handcrafted makes it that much more meaningful, too. Such a special piece. 4// Hollow Book Safe with Flask by Conduit Press- $60- Guys, I feel like I should tell you that this is the most awesome gift ever. Like, nothing beats this. It's a Bible with a cutout area for you to put your flask. COME ON! Jesus meets alcoholism. Carmen meets the bottom of the bottle. Perfect for that one friend of yours who puked on you last weekend. 5// Studded Bracelets by Moorea Seal- Moorea designs the cutest jewelry ever. Really, any girl would kill to own her designs. These bracelets are equal parts girlie and badass, which is my favorite style ever. Sweet & Sassy. Boys, these would be great for the girls in your life, girls for the girls in your life... or yourself! 1 for $20, 2 for $36, 3 for $50, 4 for $66. For a piece of beautifully handcrafted jewelry, not half bad price points. 6// 7 Wonders- $35- When this board game came into my life (via my brother Shane), I instantly became obsessed with it. It took us an hour and a half to even figure out how to play it in the first place, but it was worth it. It's complicated as hell, but a great multi-player game. Really intellectual and competitive. Perfect gift for a guy. You really don't need to buy him another video game. Old shcool board games is where it's at. All of these items are great gifts to give AND receive. Most (except for 7 Wonders) are by amazing Etsy shop owners who do a hell of a great job. Support small businesses! PS- My holiday wishlist was featured over on Scathingly Brilliant, who I'm actually sponsoring this month. I absolutely adore her blog. Check it out! I love that journal! Journals are a great gift, you can never have too many, they all look so different, and leather smells good. Okay? Mkay. 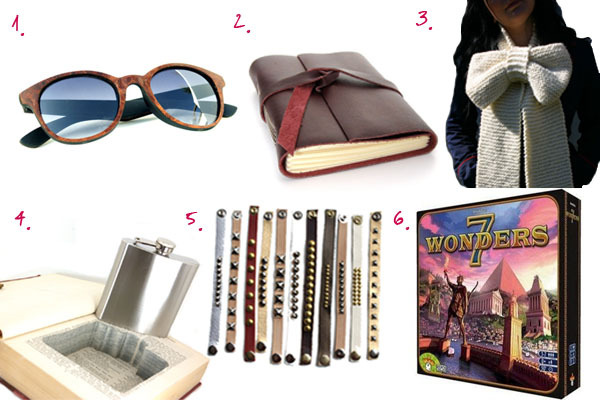 Love your blog... great gift guide. I absolutely adore that bow scarf! I really want it now!